Tomato Glasses were developed by Mr. Sungjoon Kim in 2003 in South Korea, who found that the eyewear options available for this young son just didn’t meet his needs. He sought eyewear that was more comfortable, flexible and had a better fit than what was available at the time. Tomato Glasses were designed to be the best frames for babies and children so that they love to wear them and their parents love the way they look and feel good about their purchase. Tomato Glasses offers a collection of eyewear that is comfortable, durable and fit for babies and young children and even teens according to their specific needs. The frames are made from strong, flexible non-toxic TR90 materials that are known to be safely used in medical and baby products. Tomato Glasses are remarkably lightweight (7-8 grams), and ergonomically designed so they will not press on the temples, ears or nose. The frames curve with the head and face so they are comfortable and stay in place. The founders developed the designs along with opticians and ophthalmologists to be shape intelligent to ensure the best functional fit and design. Tomato Glasses are practical, comfortable and colorful, the perfect combination for a winning pair of eyeglasses for your little one. David Green Eyewear is crafted by hand and uses processes and materials that are required to meet his stringent prerequisite criteria. Natural cotton based acetate produced in Europe is selected for properties of comfort and long lasting finish. David selects coatings with RoHS certification that conforms no harmful substances have been used in production. Factory water is recycled. Hinges and components are sourced from Italy and Germany. Nose pads from France – this is necessary in order to achieve the superior action that is notable in our eyewear. It frequently takes David and his design teams a year of preparation and trial before a frame is well thought out and launched to market. It is this depth and care that delivers comfort and elegance for the individual. All frames are designed in Cape Town. 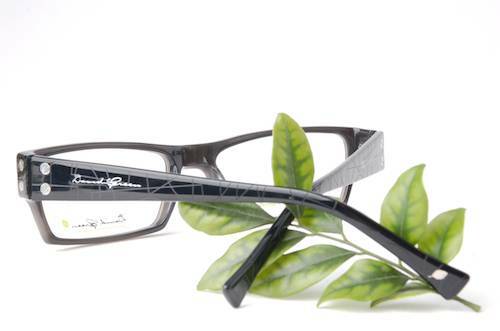 Each pair of handcrafted David Green eyewear is made with real leaves and reeds, and contains a unique fingerprint created by the incorporation of a fallen leaf or reed within the natural cotton based acetates adding additional style to the design and exacting finishes. iGreen is a unique product line which combines style and technology in an unprecedented collection! The new and revolutionary polymer at its core gives it flexibility, lightness and resistance which have never before been seen, offering sensational comfort. iGreen means style and is distinctively trendy and vibrant. The Chamaleo-ICG system and the interchangeable temples let you customize your glasses, playing with the colours and making them a truly personal accessory which is refined and elegant. Zenka modular frame components are completely interchangeable. You choose the frame you like, then the color of your frame, then your clip, then the color of your clip. There are many choices of style and color. The versatility you can achieve with these multifaceted, state-of-the-art clips and eyeglass frames is unique and unparalleled. Zenka frames are the only completely customizable frames on the market. All Zenka frames are made in France.